My recent acquisition of a few new toys has inspired me to delve into YouTube land. I keep seeing these demo videos online of synth-enthusiasts performing real-time playback of an intricate network of sequencers and synths….Korg Volcas, Arturia Minibrutes, Moog Modulars and the like. I can’t say that it’s been a style or approach I’m super familiar with, but they’re interesting to watch. I picked up a Korg MS-20 (mini) and Arp Odyssey (reissue), thinking these would be a good hardware addition to my studio. I’m so used to using software these days that I thought a little bit of a shake-up was in order. These two synths require a knowledge of subtractive synthesis programming, and can be a lot of fun once you get the hang of it. Real-time manipulation of sounds is great for coming up with new sonic ideas, and really expands the capabilities of my own setup. Plus, neither of these instruments has any preset program memory, so you have to know how to program it in order to get different sounds. The next addition was the Korg SQ-1 sequencer, which is surprisingly powerful considering it’s size. This thing really opened up some doors for me. I can trigger multiple synths from this device, while playing other instruments. And with the semi-modular patch bay on the Korg MS-20, there’s all sorts of crazy sounds that you can create with it. It also got me into thinking about the built-in arpeggiators that were already features a some of my existing synths (such as the Alesis Ion and Korg Prophecy). A few weeks later, I became enamored of the Moog Mother 32 (especially the sale price I found at a local music store). Like the MS-20, the Mother 32 has a flexible patch bay (32 points), and a built-in sequencer, and capable of some pretty crazy sounds. In this video, I’m using the Mother 32 strictly for the sequenced bassline. Lastly, I had to pick up one of the Roland boutique desktop synths, the JU-06, which is a modern re-imagining of the classic Juno 106. While limited in terms of polyphony (only 4-voice as opposed to 6-voice), and lacking a physical portamento knob, the JU-06 is a pretty faithful recreation of the original. After collecting all my new toys, I decided to take a stab at pulling off some live “synth jams” and video taping them. This is the third one I’ve tried, and I’m still learning about good camera angles and editing (which another topic entirely I think). The other two pieces in the series (“Wires,” parts 1 and part 2) aren’t as interesting, but have some fun sounds. Naturally, I had to use the entire setup (which includes a Yamaha DX27S, Yamaha P200 stage piano, Moog Little Phatty, an Alesis QSR, and my newly-tuned 1972 Fender Rhodes Mark 1 Stage 73). The Yamaha Motif 7 and MO6 shown are not being used this time around. This piece isn’t entirely improvised (I rehearsed a few chord changes and demoed some sounds first), but it’s otherwise live and raw. Just recorded direct into Logic. Also, I could resist the temptation to cheese it up with the 80’s neon grid background. Anyway, would love to get some feedback and even some suggestions on how to improve the setup, the video, or anything else. Hope you all enjoy it! I recently produced a 4-part demo screencast describing my keyboard setup I use for “Piano Men,” which is an Elton John/Billy Joel tribute band that I play with. It’s bit long (around 35 minutes altogether), but I’m trying to get the hang of producing these videos. It’s pretty thorough (I go into all the hardware, software, and synth plugins I use). Hopefully more to come in the future! Would love to get your feedback! Atlanta-based keyboard player and tech Eric Frampton gives a detailed explanation of how he restored his classic Rhodes Chroma. He also offers a demo of the various factory presets, and does a shootout with a classic MemoryMoog! 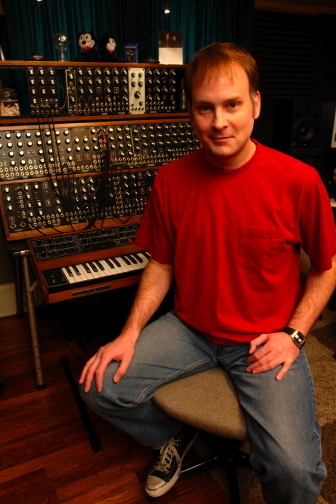 This last year, I had the good fortune to catch up with my friend and fellow keyboardist, Eric Frampton, for a series of in-depth conversations about his impressive array of vintage synthesizers and keyboard instruments! Eric, who’s worked with Paul Simon, the B-52’s, Yanni, and Mother’s Finest, gives some great information and demonstrations on his Rhodes Suitcase Mark II, an Oberheim 4-Voice, a MemoryMoog, a Prophet 10, and a Rhodes Chroma. In a forth-coming series (to be posted very soon), Eric digs even deeper into the Rhodes Chroma, which (at the time of this filming) was being restored and hence was not playable. In the meantime, be sure to catch Eric in and around the Atlanta area playing with Yacht Rock Schooner and Electric Avenue! You won’t be disappointed! I produced some music for a video game last fall, and now you can purchase it (and the game) here…..enjoy!